The house was beautiful and very clean. The views were great and we were within driving distance to the places we had on our list to see. It is in a very quiet and peaceful location and we definitely enjoyed it. Craig Opels was so gracious, welcoming, and friendly. He let us know where he was in case we needed anything and greeted us both when we arrived and left. He thanked us for staying and made friendly conversation.. Absolutely loved everything about Opels Cabin 2. The location was secluded enough and perfect. The beach access is so close and beautiful. The cabin was neatly kept and very clean. Mr. Opels greeted us and stopped by as we were leaving to thank us. Incredibly friendly. The cabin was stocked with all necessities and more. We were very pleasantly surprised with all of it. The house location, amenities and just everything was spectacular! We had such an amazing trip! Always good access to website,payment easy, good response to a previous cabin issue. Housekeeping seems thorough, always clean and tidy. This was our second stay at this lovely cabin. It is spotlessly clean, comfortable,and a pleasure to be in. 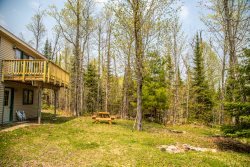 The location is great for visiting Grand Marais, Lutsen, and many nice hikes on the Superior Hiking trail. Our stay at Amazing Grace was perfect. It was the nicest blend of the comfort and rustic stay we were looking for. It truly felt like an escape from it all for our family. We really appreciated all of the attention to detail that the cabin had. It felt like a home away from home. And let's not forget the view and the absolutely stunning lake shore just outside the front door. Our family had the best time!